Today, many of the Institute’s permanent Faculty and the Members and their families who visit the Institute each year live on or very close to campus, creating a sense of community that fosters serendipitous interactions and incidental discussions from which important insights often follow. In the development of its campus, members of the Institute’s Buildings and Grounds Committee made it a priority to provide local housing for the Members and a large proportion of the Faculty to allow for the cultivation of ideas in a true academic village. By the end of 1936, there existed throughout Princeton a significant shortage of available housing, and what little was available was also very expensive. The Institute turned to Swarthmore College and Princeton University to examine how they used part of their endowment to build rental housing for faculty. In early 1937, the Institute’s Board determined that it was essential that everything possible be done to assist Faculty in acquiring nearby homes. A plan was devised by Winfield Riefler, Professor (1935–49) in the School of Economics and Politics (it became part of the School of Historical Studies in 1949), that involved the Institute’s sale of land that was not essential for its main campus to those Faculty who wished to erect homes for their own occupancy. The Institute hired an architectural firm to review and identify sites on Olden Farm for the purpose of providing housing to Faculty. Subsequently, Battle Road Circle was designed and built, with roads and Faculty housing completed before Fuld Hall construction was finished. Over the years, the Institute has continued to develop its land mindful of the need to be able to provide adequate housing for its Faculty. In the near future, the Institute plans to build additional Faculty homes on its campus so as to preserve its fundamental character as a residential institution. As time went by and the Institute grew, the need for designated Member housing located close to the Institute became apparent. In 1941, the Board of Trustees began investigating the option of building apartments for visiting scholars. The urgency of the need called for quick action. Unfortunately, building during wartime was impossible, and the Institute looked into the possibility of prefabricated housing. It took until 1946 before firm plans were set to erect dwellings consisting of four six-family units and seven two-family units between Cook and Goodman Roads. Julian Bigelow, Member in the Electronic Computer Project and later the Schools of Mathematics and Natural Sciences, offered to negotiate on behalf of the Institute with the Federal Public Housing Authority for surplus government housing that could be made available to educational institutions. Director Frank Aydelotte, who filed the application for the housing, stressed the excellent quality of these buildings, which were not prefabricated but individually constructed at Mineville, New York, on the edge of the Adirondacks. 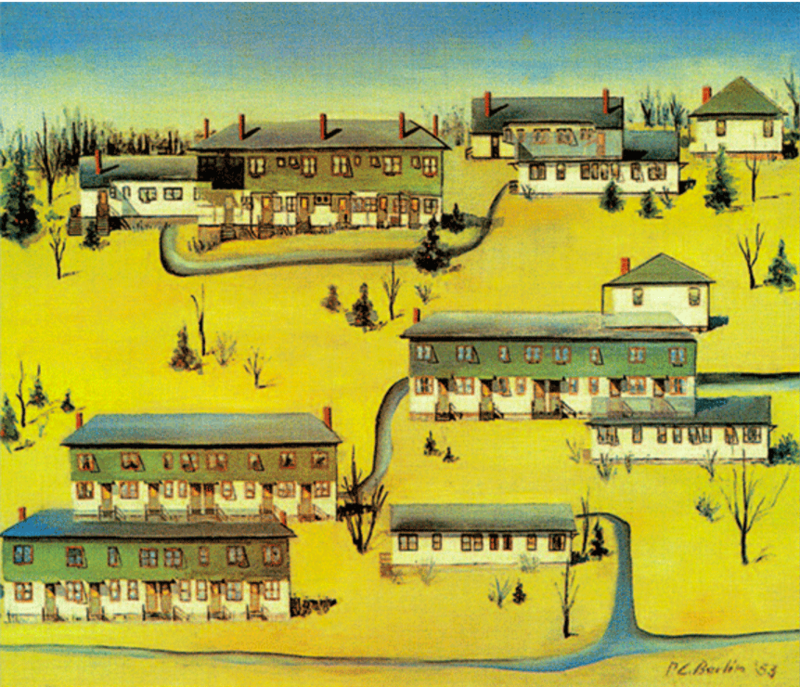 With Bigelow’s guidance, the Institute was able to purchase eleven buildings containing thirty-eight apartments of two and three bedrooms each. These apartments were substantially built, with hardwood floors, insulation, storm windows, fly screens, clothes lines, and garbage pails, lacking only electric refrigerators. With the assistance of an Institute Trustee, Lessing J. Rosenwald, who was Chairman of Sears, Roebuck and Co., the Institute was able to secure thirty-eight electric refrigerators from Sears. The housing units were “panelized” for transportation to Princeton, and they were occupied in early 1947. Sketch of Breuer housing, which featured "the restful horizontality of one- and two-story row houses." However, by 1957, the limitations of the Member housing, heated by coal stoves that required constant stoking during the long New Jersey winters, was apparent to J. Robert Oppenheimer, Director of the Institute from 1947 to 1966. He hired the noted architect Marcel Breuer to design a complex of Member housing more appropriate to the community. According to an article in Architectural Record in March 1968, one of the important factors in planning the arrangement of the plot was the provision of an environment and facilities to foster the community spirit of the Membership. The focus was on the “village green,” with the natural configuration and character of the land being maintained and the placement of buildings fit to the existing contours of the land. Open House Day was held on October 11, 1957, offering tours of the new Breuer apartments to the Princeton community. The Breuer design was so successful that the Institute found only very minor changes were needed when the housing was expanded in 1968, and again in 1973 and 2000.